TOBACCO CONTROL NIGERIA "WORLD NO TOBACCO DAY"
Join @TobaccoCtrl in celebrating the World No Tobacco Day and stand a chance of winning a Samsung tablet, Mini laptop or a Z10. •Invite 10 friends to follow @TobaccoCtrl on twitter. 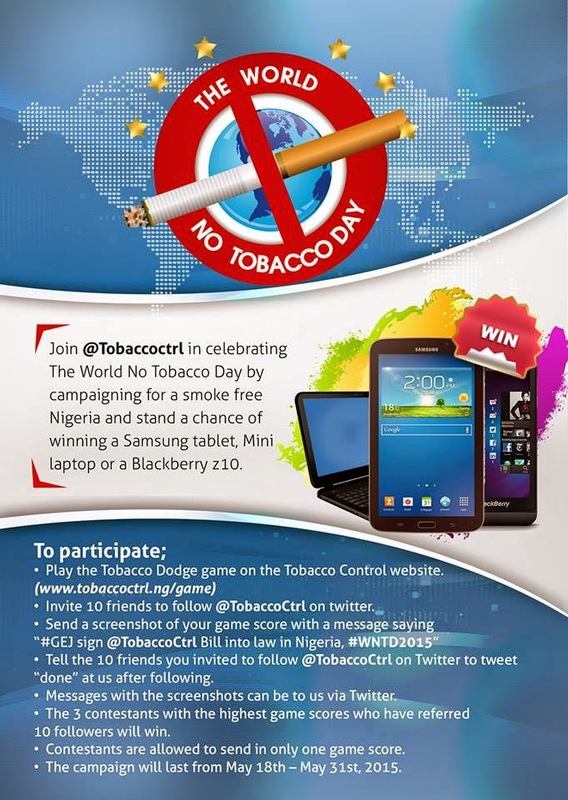 •Send a screenshot of your game score with a message saying “#GEJ sign @TobaccoCtrl Bill into law in Nigeria. •Tell the 10 friends you invited to follow @TobaccoCtrl on Twitter to tweet “done” at us after following. •Messages with the screenshots can be to us via Twitter. •The 3 contestants with the highest game scores who have referred 10 followers will win. •In the case of a tie in scores, winners will be chosen on a first-to-submit basis. The campaign will last till May 31st, 2015.